George W. Bush, left, joins Jay Leno on “The Tonight Show” in 2013. President George W. Bush left the White House as one of the most disliked presidents in our nation’s history. With approval ratings struggling to hit 30 percent, he was an albatross hanging over fellow Republican John McCain during the 2008 presidential election. Even four years later, as President Obama ran for re-election, the majority of voters thought Bush was more responsible for economic problems in the United States than Obama. But over the past year, polling data has begun to suggest that Bush is no longer quite the liability he once was for the GOP, and that most Americans no longer see the current economy as something Obama inherited. Since April, Bush’s favorable rating has averaged 49.3 percent. His unfavorable rating has averaged 46.3 percent. More Americans now like Bush than dislike him. Of course, 49.3 percent is far lower than Jimmy Carter’s 58 percent favorability rating, recorded in April 2013, but Bush has seen a moderate improvement over the past four years. In his last weeks in office, Bush’s favorable rating averaged just 37.3 percent; his unfavorable rating averaged 57.8 percent. Moreover, the percentage who believe that Obama inherited the nation’s current economic conditions has dipped below 50 percent for the first time. According to the latest NBC News/Wall Street Journal poll, it’s just 46 percent of Americans. Although that’s only one poll, it’s far beyond the prior low of 56 percent recorded by the NBC survey. And nearly 50 percent is not that low considering that Obama has been in the Oval Office for more than five years. The percentage who believe Obama is responsible is also at an all-time high: 39 percent in the NBC/Wall Street Journal poll. None of this data suggests that Bush is popular or should be trotted out by Republicans in the 2014 midterms elections. What it does tell us is that Democrats who try to tie Republicans to the Bush years may not have the same success they had a few years ago. Bush is much more of a neutral figure in the eyes of Americans. At the same time, Obama and his fellow Democrats’ ability to lay the economic situation at the feet of his predecessor is weakened. 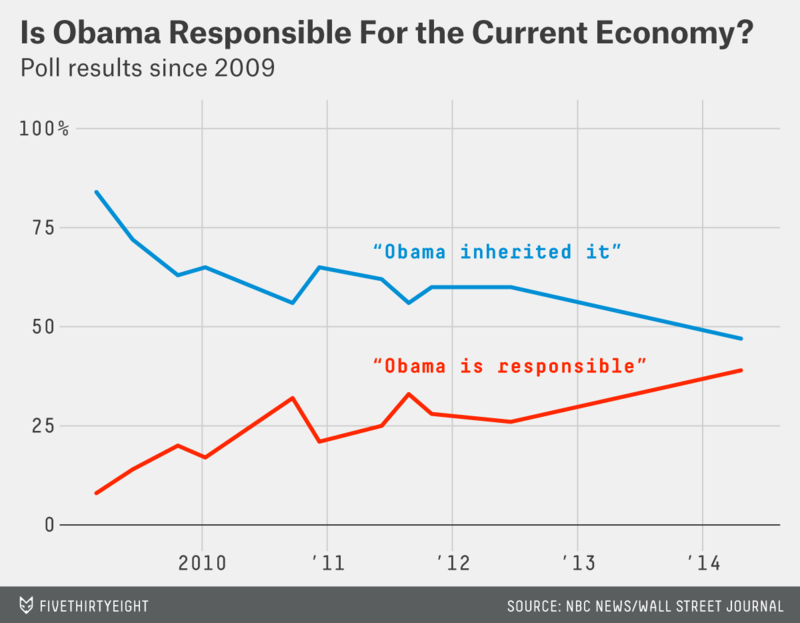 By 2016, it’s possible that the majority of Americans will hold Obama responsible for the state of the economy.